The Geneva International Motor Show kicked off today and Apple had an announcement about a system which had previously been known as 'iOS in the car'. CarPlay is said to be a safer, easier and more fun way to use your iPhone in your car using steering wheel controls, Siri and the built-in in-car display panel. A long list of manufacturers which will support CarPlay has been published by Apple. Also Ferrari, Mercedes-Benz and Volvo will all have models including this iPhone linking system at the show in Geneva this week. CarPlay allows you to intuitively control your iPhone to "make calls, use Maps, listen to music and access messages with just a word or a touch". You won't be touching your phone though – CarPlay links your phone to the car steering wheel controls and you can use Siri for voice commands too if you wish. CarPlay also makes use of the car's larger built-in display panel to present the info you need. "iPhone users always want their content at their fingertips and CarPlay lets drivers use their iPhone in the car with minimized distraction. We have an amazing lineup of auto partners rolling out CarPlay, and we’re thrilled it will make its debut this week in Geneva," said Greg Joswiak, Apple’s vice president of iPhone and iOS Product Marketing. Communications: Siri allows you to accesses contacts, make calls, return calls and listen to voicemail. Also Siri can help you by reading out and taking your dictated responses to text based communications. Maps: the mapping system anticipates destinations based upon recent emails, texts and friend's destinations. It offers routing instructions, traffic conditions and ETA info. Siri can also help you with spoken turn-by-turn directions. 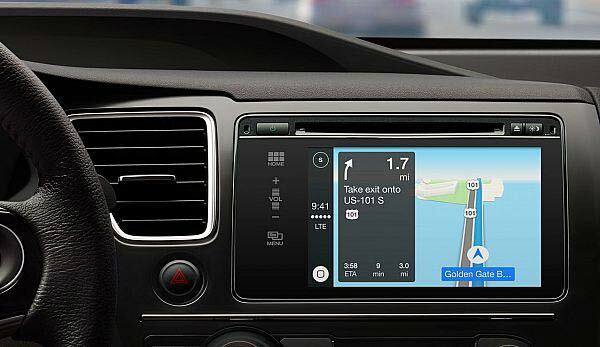 Maps will appear on your large in-car display panel. Media: CarPlay also gives you in car access to all your music, podcasts, audiobooks and iTunes Radio. Control these using your car's built-in controls or ask Siri to navigate or control your library playback. Third party audio apps like Spotify are also supported. To use CarPlay you will need and iPhone with a lightning connector and iOS7. 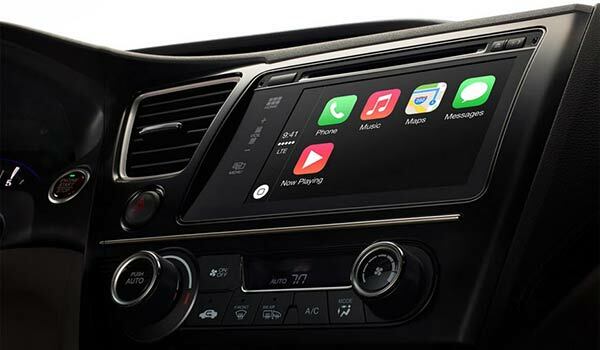 Manufacturers joining Ferrari, Mercedes-Benz and Volvo in producing CarPlay automobiles include; MW Group, Ford, General Motors, Honda, Hyundai Motor Company, Jaguar Land Rover, Kia Motors, Mitsubishi Motors, Nissan Motor Company, PSA Peugeot Citroën, Subaru, Suzuki and Toyota Motor Corp. In a related development, a rival in-car system being developed by Google has been whiffed by the Engadget newshounds. The info comes from a job vacancy ad at Daimler in Germany. The advert is for a software engineer to help implement 'Google Projected Mode'. This system sounds like a dashboard docking system for Android mobiles. Much like CarPlay, the Android smartphone will then use the car's built-in display and controls for safely partaking in calls, messaging and media playback. 7 Hyundai Elevate car can walk "in mammalian and reptilian style"
Firm thinks it could be useful for exploration or as a disaster relief vehicle. But the car batteries and cables need active cooling to soak up the 450kW safely. Security system opens to cloned key fob but an added PIN feature might help secure the cars. Also Ferrari, Mercedes-Benz and Volvo will all have models including this iPhone linking system at the show in Geneva this week. … To use CarPlay you will need and iPhone with a lightning connector and iOS7. Manufacturers joining Ferrari, Mercedes-Benz and Volvo in producing CarPlay automobiles include; MW Group, Ford, General Motors, Honda, Hyundai Motor Company, Jaguar Land Rover, Kia Motors, Mitsubishi Motors, Nissan Motor Company, PSA Peugeot Citroën, Subaru, Suzuki and Toyota Motor Corp. So to use this “great” feature you're not only going to have to have a iPhone, but also one of the latest models? This is dumb elitist nonsense of the first order - and something that I really, really hope that some one (EU?) jumps on from a great height, since it's clearly restricting consumer choice. And no, I'm not advocating the Google version - that's equally stupid (based on what limited information is available). I'll take an interest when some enlightened group/company decides to do a system that works with iPhone, Android and maybe Windows Phone. Until then, I'd regard having this system on board as a drawback rather than a positive feature, and definitely one I wouldn't want to pay for. In a car, a decent stereo and, when needed, standalone SatNav is all I need, and want. Anything like this Apple system is something I actively don't want. And as for any notion of a Google system, I not only wouldn't pay for it but it would be enough to stop me buying any car to which it was fitted. Should be something platform agnostic like mirrorlink. Wonder if we're going to see lots of second hand cars with these systems built in that are completely useless in three years time as lets face it Apple rarely make anything thats hardware/software compatible after ~3 years have past! I do hope these cars come with their own satnav… or have Apple ficed their maps now? I could tolerate it if the interface was iOS but worked with any smart phone/bluetooth, but I would not pay for something in a car that only works with a specific (phone) manufacturer.